22 AprWedding Wagons: Available For Rent? As word spreads about Mini Wedding Wagons and our adorable line of handmade wagons, we have received an increasing amount of inquiries into renting a wagon. Because we put so much care into ensuring that each of our pieces is custom made to the exact specifications of our clients, we do not keep a stock of wagons available for rent. The best way to save money on a custom wedding wagon is to purchase one, and then resell it. There are several wedding websites that specialize in used wedding equipment, such as Bridal Garage Sales, Wedding Recycle, and Tradesy. Even eBay could work. Not only will you get a brand new wedding wagon made the way you want it, but you can set the price that you resell the piece for. Some people might even be willing to pay more than what you spent on the piece if they’re looking for a last-second purchase and can’t wait for a custom wagon to be made from scratch! Why resell your wagon when you can rent it out yourself? For the entrepreneurs out there, we recommend purchasing your wagon, then renting it out to other members of your community who may be interested in using a wagon for their next event. You’ll make enough money to pay for the original cost of the wagon, and then some! Your income only ends when you decide to stop renting the piece out. 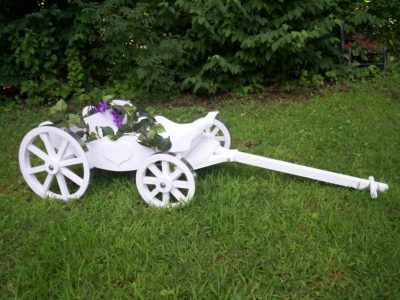 This adorable Charming Carriage will look great in the garden after being used for your big event! Our beautiful handcrafted pieces deserve more than just one walk down the aisle! Consider your purchase an investment, and reuse your wagon as a home décor piece, cute storage container, or an adorable piece to take outdoors as the weather warms up. Some of our favorite ways to repurpose our wagons is by using them as outdoor yard décor, filling them with potted plants. They’re also a great place to store toys in a playroom, or to hold books or flowers in your living room. Of course, they’re always a showstopper whenever taken out in public, so show off your new favorite piece on your next outdoor excursion! Load it up with food for a picnic, pile your kids in for a walk to the park, or load up your pets for a trip around the neighborhood. Be sure to factor in some extra time…we can guarantee you’ll be stopped frequently by admirers asking where you got your adorable wagon! Contact Mini Wedding Wagons today to order your custom wedding wagon, and get ready to use it time and again in the future!